Due to poor orders demand Microsoft have changed things on their Xbox One.. You will be able to game offline for one. The lending,selling and used games restrictions have also been scrapped. We owe it to Sony and ourselves to buy the PS4 if buying a machine as we know what Microsoft’s plan is if they manage to kill off the playstation. the main problem is still there though, the “always watching” kinect cameras. THIS! I wonder if Windows 9 will require an always on spy cam? Had an Xbone pre-ordered. Canceled that the night the PS4 was announced. So you cancelled a preorder that wasn’t available before the PS4 had their conference pre-xbone conference? that’s a software fix though, and it can be overridden at any time by anyone that decides it needs to be on. There’s plenty of script kiddies out there doing that with computer’s webcams, why would it be any different with xbox cameras? They are still watching you however! Still waiting on a reason to buy either. Currently own a 360. Will not be buying any more microsoft consoles in the future. 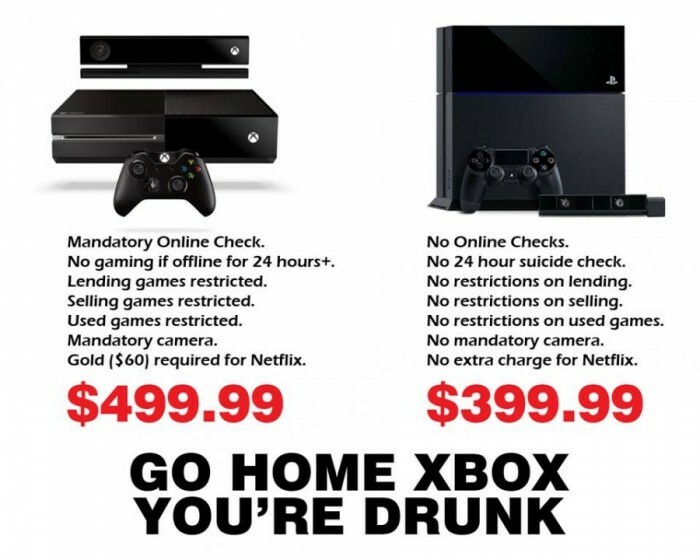 PC gaming ftw. Micro$oft want =s to spy on me, and they want me to pay them for the privilege… not gonna happen. The funny thing about Steam is, my computer runs Steam and also runs other things other than Steam. And was cheaper than a brand new Xbox.